BTC – By now we’ve all heard or experienced tales of personal horror at TSA’s use of the Rapiscan backscatter X-Ray machines at airports. I recently read an article where DHS Secretary Napolitano used the words “shared responsibility” when it comes to providing security in America. Unfortunately – those words seemed more like a cry for help. I would hate to think of what could happen if we further neglected the solutions rather than solely pitching in the complaint department. It might be worth some salt to offer the TSA solutions. Coming from Silicon Valley, AOPTIX, makers of iris scan biometrics, seem to be the next in line to the begging trough for dwindling reserves of federal money for private security contracts. I could battle another Big Tech biometric identity mandate or I could throw my hat in the ring with solutions which beat the elusive but eventual TSA cavity search for fliers. None of this is any fun. Contracts with the Department of Homeland Security (DHS) are spewing billions of dollars into private industry, largely to companies that also rely on Pentagon military contracts. In this new variation of the military-industrial complex a new revolving door is now in full swing. Tom Ridge and Michael Chertoff, the two Republican stalwarts who served as the first two Department of Homeland Security secretaries, are now busy attracting defense, homeland security, and intelligence contracts in the country’s rapidly expanding high-tech security complex. Tom Ridge, former Pennsylvania governor who was appointed by President Bush to direct the newly created DHS, has parlayed his government service into a lucrative career in business since he stepped down as DHS chief in November 2004. Soon after leaving DHS, Tom Ridge became president and CEO of Ridge Global, a global strategic consulting firm. He also has joined numerous corporate boards and advisory groups, including major military and homeland security contractors. (See Box: Ridge’s Post-DHS Security Businesses). Michael Chertoff, former secretary of the DHS, has taken his portfolio over to the private sector. Homeland security is business—an estimated $200 billion in annual revenues—and the newly formed Chertoff Group is seeking a major stake in this booming industry. As the latest homeland security consulting firm, Chertoff Group will be competing with two other security companies formed by top Republican Party figures: Ashcroft Group founded by former Attorney General John Ashcroft; and Guiliani Group, formed by former New York City mayor and presidential candidate Rudolf Guiliani. Although not specifically focused on homeland security, Ridge Global, formed by the first DHS secretary Tom Ridge, also has a piece of the expanding global security industry. The Chertoff Group has a leg up on its competitors. The revolving door between government and industry has brought a half-dozen former high government officials of the Bush administration into the Chertoff Group. 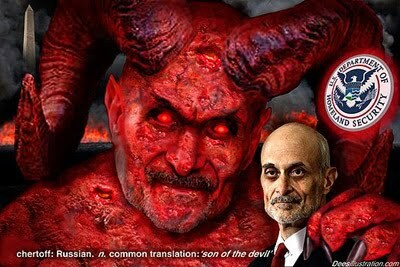 Not only does it count on the political and business connections of Chertoff, the new firm has a roster of five other former government officials that can translate government experience and inside information into lucrative industry contracts.